"The kitchen is the new dining room. It has become the backdrop for life," declares interior designer Michael Berman, the creative mind behind this voluminous kitchen in Beverly Hills. "I imagine it as a stage, and all the players are your family and guests. If you've choreographed and art directed the space well, it will be a smash hit." Working along with architect Magdalena Glen-Schieneman, builders Horizon General Contractors and lighting designer John Brubaker, Berman orchestrated a dramatic culinary platform with hints of three underlying themes: modernism, Art Deco, and Asian minimalism. One of these calculated design references was the arresting backsplash, crafted from Berman's own clover-hued Marquis design for Walker Zanger, which undoubtedly steals the show. "This tile pattern gives a nod to vintage pressed tin used for Deco ceilings and wainscoting in early 20th-century interiors, but also speaks of modernism. 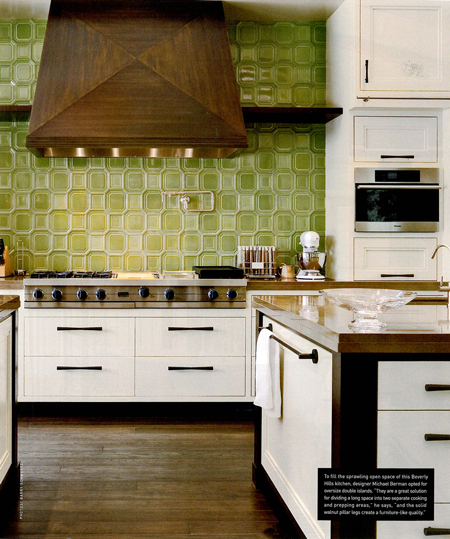 Plus, I love large wall spaces with soaring textured tile as backdrops to a cooking area. It's pure luxury." To balance the cool green tones of the tile and Holly Hunt dining chairs in the breakfast room, Berman crowned the space with a brushed-bronze hood that lends depth and design detail to the overall scene, while satin-finished cabinetry, complete with two commanding islands, impart eye-pleasing symmetry. To fill the sprawling open space of this Beverly Hills kitchen, designer Michael Berman opted for oversize double islands. "They are a great solution for dividing a long space into two separate cooking and prepping areas," he says, "and the solid walnut pillar legs create a furniture-like quality."